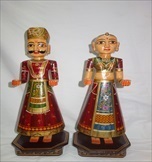 King & Queen set (0614/P0377/06) Handpainted and carved wooden Gangor (King & Queen set) representing Shiv Parvati. India has been an enigma to many across the globe. A Country that has inspired trends, aroused curiosity, delighted tourists and at the end of it, all left an impression on the minds of everybody who has visited it. The World famous Central Cottage Industries Emporium is the India’s window to the world for nearly over 60 years for authentic handloom and handicraft products. Post colonialism, seeing the adverse effects of industrialization on the Indian economy and social milieu, a need was felt to give Indian crafts its rightful place and enthuse the parched creative spirits of millions of craftspersons across the country and help them to earn a decent livelihood. In 1952, cottage was conceived by a band of dedicated art lovers and their consistent endeavour led to the creation of “ Cottage” – the abode of Indian handloom & handicrafts that helped to restore the craftspersons pride in their work, recognized their genius and gave them a viable and honoured future.